The Irish low cost air carrier Ryanair, which intends from October 2018 to launch flights to Kyiv and Lviv, does not rule out the opening of a subsidiary in Ukraine in future, but this should be preceded by the development of the network and the basing of planes here, Ryanair CEO Michael O'Leary has said at a press conference at Boryspil airport. "We have confidence that at least two large airports will be added in the next two years, and more routes from Kyiv and Lviv. The next big stage, which we have already discussed with the minister [Minister of Infrastructure of Ukraine Volodymyr Omelyan] is the possibility of opening bases in Ukraine. This can happen when we operate in three or four airports and have a certain number of routes. We expect that in Ukraine we will grow faster than in Poland," he said. The expert stressed that it is too premature to talk about the Ukrainian subsidiary, first 15 new routes should be launched and passenger traffic should start growing. 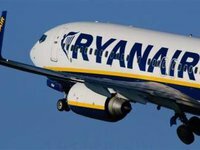 As reported, Ryanair in October 2018 will launch flights on ten directions from Kyiv and five from Lviv. Thus, the company will launch flights from Kyiv to Barcelona (four flights a week), Bratislava and Wroclaw (three), Warsaw (four), Krakow (three), Poznan and Gdansk (two each), Vilnius and Stockholm (three each) London (five), from Lviv to Krakow (three), Warsaw (three), Dusseldorf (three), Memmingen (two), and London (three).